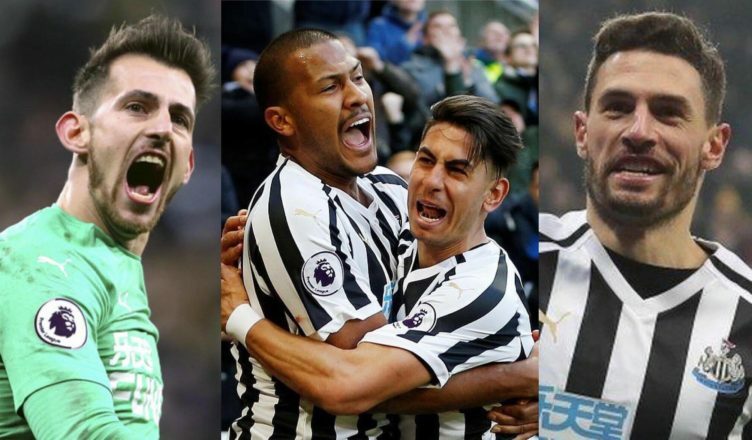 6,000 NUFC fans vote for their 2018/19 Player of the Season – 4 candidates – See results here – NUFC blog – Newcastle United blog – NUFC Fixtures, News and Forum. Following an online poll that received well over 6,000 votes, Newcastle fans have voted for Salomon Rondon as our unofficial ‘Player of the Season’ for the 2018/19 campaign. The Venezuelan got a whopping 61% of the vote, with the three other ‘nominees’ being Fabian Schar (who gained 16% of the vote), Martin Dubravka (13%) and Ayoze Perez (10%). With just seven games to go, who has been your #nufc Player of the Season? One of these, or someone else? There has been a real feel good factor since the turn of the year for United – on the field at least. All four players have been superb of late as we move towards safety, with the last gasp draw at Bournemouth at the weekend meaning we are now seven clear of the drop zone and with a far superior goal difference. It is hard to argue against Rondon – he has been immense for Newcastle this year. A return of 10 goals and 5 assists, considering he was injured at the start of the season, is superb. It is his all round game that has been pivotal to the tactics deployed by Benitez this season. He leads the line so well, bringing others to into play and is really thriving with the extra space he now gets following the arrival of Almiron. We’d be crazy to not push as hard as they can to make him the first permanent signing of the summer. Perez has really come into his own since Almiron arrived – his two goals to grab the win over Everton typifying his clear improvement this season. He can still frustrate at times but it is time to perhaps accept he is a key player for Newcastle these days and has been a superb signing for just £1.5m from Tenerife back in 2014. Schar has arguably been one of the signings of the season across the whole Premier League following his move from relegated Deportivo in the summer, for a meagre £3m. The Swiss international is classy on the ball with an eye for goal – that strike against Burnley will surely be our goal of the season. He offers us the flexibility and balance at the back when we play three centre-backs and should be pleased with his debut season in England. Dubravka may have made a few errors last month but he has still also had an impressive year overall and is continually linked to Italian giants Juventus. He has the 5th highest number of clean sheets in the league and helps control our defence – he is another who can look back on a strong season. Who would be your player of the season and why?